Bilot delivered a new SmartMDM based solution for YIT to create and manage their project master data in an easy, cost efficient and timely manner. The tool enables end users to provide the required and consistent information for automated creation of new SAP PS (Project System) project once the request has been reviewed by approvers. YIT leads the way in construction field. YIT creates more attractive and sustainable urban environments by building housing, business premises, infrastructure and entire areas. YIT is the largest residential construction company in Finland and the largest foreign residential construction company in Russia. 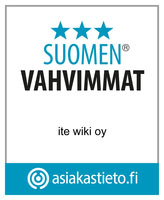 YIT is also one of the largest business premises and infrastructure construction companies in Finland. Besides Finland and Russia YIT operates also in the Baltics and Central Eastern European countries. 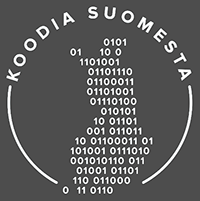 Company has nearly 6000 employees and revenue for 2014 amounted to 1.8 billion EUR. YIT aims at being a leading European developer, builder and service provider creating shared value with high responsibility. YIT has commonly agreed master data definitions for constructions projects but lacked a common way of creating the projects. Additionally, no suitable workflow nor all required validation rules for mandatory data exist in the several back end systems used for maintaining construction project data. Bilot’s SmartMDM was seen as the perfect solution for these challenges. Thinking big, starting small: for the first phase the scope was set to creating a new project for YIT Finland with SAP ECC as the back end system. The new intelligent, collaborative and user friendly way of creating projects into SAP PS was implemented to replace the old way of creating projects with WBS manually to SAP. The data forms and workflows of SmartMDM were configured to meet YIT needs for entering flawless, high quality project master data using the workflow to fully support YIT project creation process. Data quality is ensured not only by having value lists read directly from SAP ECC but also by configuring additional business rules when needed. “We see that instead of enforcing the various local level back end systems to meet the expected level of user experience, it is substantially easier and much more cost efficient to provide a common platform on top of our local level back end systems. For that purpose, the SmartMDM solution developed by Bilot, is a perfect fit.” Heikki Sulonen, YIT says. Solution will be enhanced with modifying the existing projects in SAP and expanding the usage to Russia, Baltics and Central Eastern European countries with 1C and Navision Axapta systems as back ends for the SmartMDM Project Master Data solution. In the future SmartMDM may be used for managing data in other master data domains e.g. Customer, Vendor or Material master data. Cooperation between YIT and Bilot went smoothly. 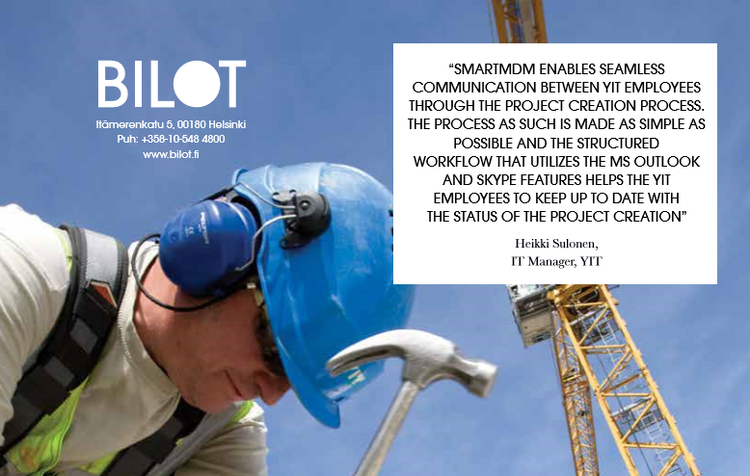 Bilot’s own product SmartMDM was chosen as the platform because YIT wanted to provide the end users with a uniformed view to the construction project data throughout the project lifecycle, regardless of the back end system the user is authorized to use.